weiner rover « Big Squid RC – RC Car and Truck News, Reviews, Videos, and More! You are browsing the "weiner rover" tag archive. My RC Car Has a First Name, it’s O-S-C-A-R?! 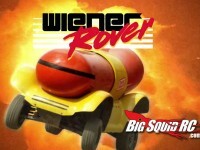 Cruising around the web today, and I couldn’t help but enjoy the newest creation from Oscar Mayer, the Wiener Rover! With the chassis of a 1/5 scale RC car, this bad boy will bash its way to you delivering delicious hot dogs! Check out the video above!